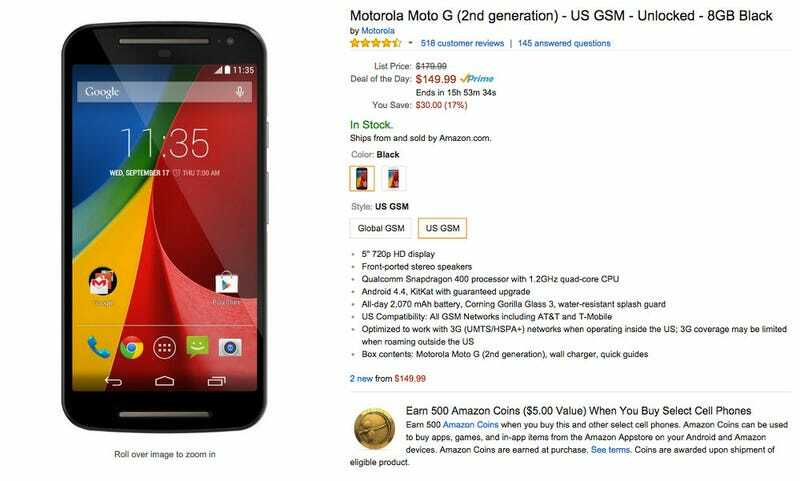 Friendly Notice: Moto G (2nd Gen.) on sale on Amazon! You can find the black version here and the white version here and it is going for $149.99, which is discounted $30 from the normal price. For those wondering, that price is for an off contract device that I would recommend in a heartbeat to anyone needing a new GSM (SIM card using) phone. That price is for both the Global and U.S. variants. The device itself has a 5" HD display, stereo speakers, a Snapdragon 400 (quad-core) processor, 2,070mAh battery, 8 MP rear camera, 1 GB of RAM and a miscroSD card slot that will support 32 GB microSD cards. Oh yeah, it's also received the update to Lollipop! Seriously, why are you still reading this? If you're in the market for a new phone and don't want to break the bank there are absolutely no better options in my opinion than the Moto G.
Keep in mind the device does not have LTE capability, but despite that you'll get HSPA+ compatibility and speeds. If you've never used LTE you won't know what you're missing, if you have then I don't know what to tell you. This would still make a great backup phone for emergency or tinkering purposes, not that I'd do anything myself but root this device. Motorola's software additions to Android make an already great mobile OS better and I personally refer to most new Motorola devices as running Android+. Useful features, no gimmicks. It'd make a great stocking stuffer for anyone still using an old device. I mean either get your Grinch relatives this or Krampus might pay them a visit. Also if you aren't following MisterKrampus on Twitter you really need to do so, stat. His tweets at this time of the year are what I look forward to more than anything else, except for the Doctor Who annual Christmas special.